This should be banned. Animals are not trophies. Keep up the good work. I live in Florida and spend a lot of time in the ocean, diving, snorkeling, etc. I have interacted with sharks dozens of times. They’re magnificent creatures. Disgusting not sport, killing for no reason. We all have one life, even a shark. Please stop killing these magnificent creatures. You could go for a run, learn martial arts skills, surf, read a book, learn how to paint, take a creative writing class, clean up the ocean and its beaches, learn about marine conservation…You could do something so much better with your time rather than follow a sociopathic urge to kill. We have to stop all Shark fishing tournaments in the US in addition to working to end all shark finning worldwide. Proud to support your efforts! Sharks are beautiful creatures and vital to the ecosystem of our oceans. Thank you Lewis Pugh for raising awareness to this important matter. Humanity at its worst. Nb. Are you in the position to persuade National Geographic TV not to endorse such cruelty with their documentary on hunting what they call ‘sea monsters’? Those who kill for fun are real monsters. Let’s fight for our friends in the ocean. Let’s create an annual charity open water swim event to support our sharks, dolphins, whales. We are their guests in the ocean and we should appreciate that. I cannot believe the depths of depravity that some humans can sink to. Please ban shark hunting. These creatures are close to becoming extinct! THEY SHOULD NOT BE HUNTED! Make the Mako non-sport. Yamaha is irresponsible for their sponsorship. The Mako is important to the balance of ocean life. Or maybe I should become an ocean ranger! Utter BASTSTARDS. Please can someone start a petition to get this banned? Driving into the lovely seaside village of Cape May, New Jersey, I was stuck by two conflicting images. On one side of the marina was a sign welcoming visitors to this proud tourist destination, and inviting them to enjoy a spot of whale watching. 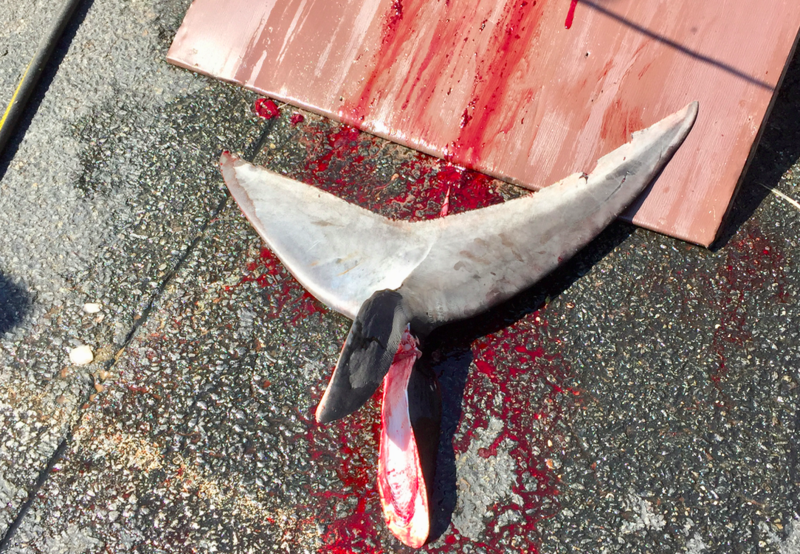 On the other was a large mako shark, recently caught, strung up and bleeding on a gantry. Cape May is roughly halfway between Washington D.C. and New York, where I had just attended the inaugural United Nations Oceans Conference. For one week, global leaders and NGOs had gathered to share their concerns and discuss measures to protect the world’s oceans and all the creatures that live in them. The mako shark is one such creature. The International Union for the Conservation of Nature (IUCN) is the global authority on the status of the natural world and the measures needed to safeguard it. The IUCN considers the mako “vulnerable to extinction”. And yet just a two-hour drive away from New York, mako sharks were being hunted in a sponsored competition – on World Oceans Day! The thoughtless timing may have been coincidental – during the summer there are some 70 such competitions on the US East Coast. 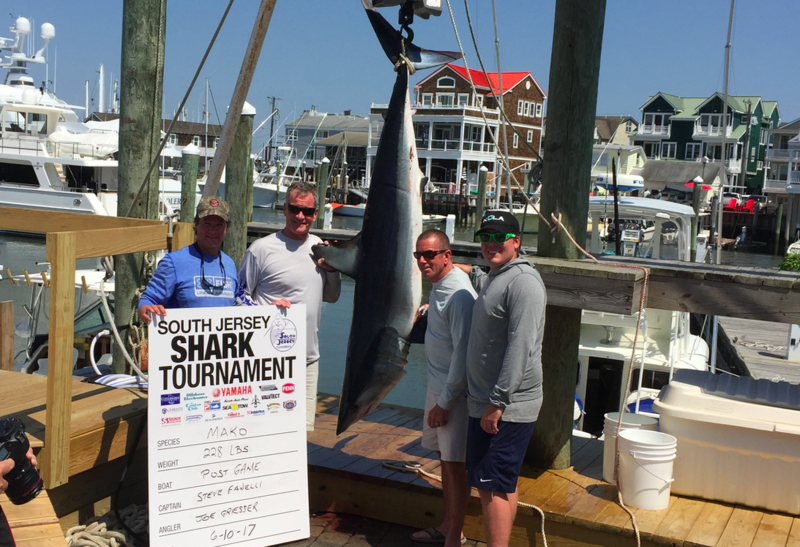 But when I heard about the South Jersey Shark Tournament, I decided to drive down and see for myself. 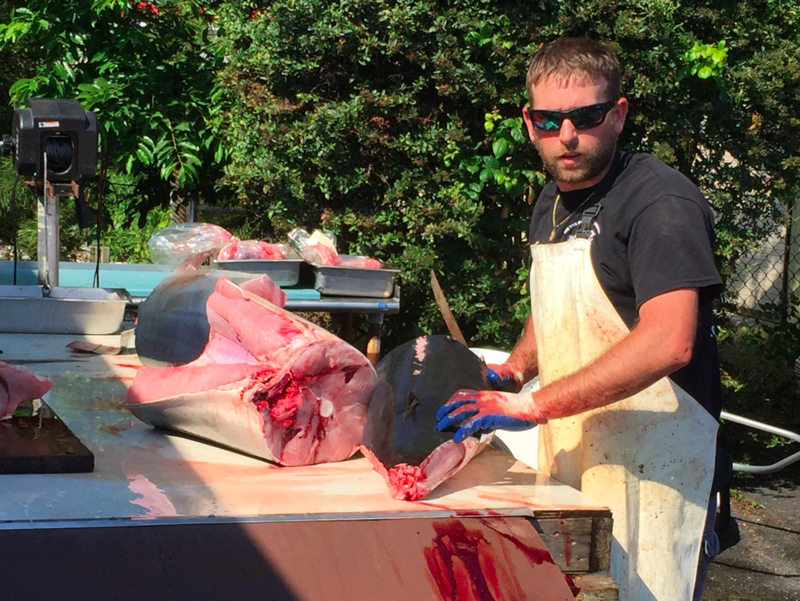 I was greeted by the sight of the winning shark, a magnificent 310lb (140kg) mako, hanging lifeless on the pier. I looked at its beautiful deep-blue metallic sheen, and pictured it hours before, cruising the ocean depths, doing the important work of all apex predators, which is to keep things in balance. Makos are among the world’s fastest sharks, and the most aerobatic – their spectacular leaps out of the water make them prize quarry for sport fisherman. The mako strung up in front of me would have been at least 8 years old. Left alone in the wild, mako sharks are long-lived. Like whales, they are slow to reproduce and have very few young. In the Mediterranean, a potential nursery ground for Atlantic makos, the IUCN has listed them as “critically endangered”. That’s just one level below “extinct in the wild”. The Mako is a migratory species that doesn’t recognise international borders. Its western Atlantic range – where this one was caught – stretches from the Grand Banks off Canada down to northern Argentina. To the east, mako sharks cruise the Atlantic coast off Norway down past the British Isles and around the African bulge and down to the continent’s tip. The IUCN lists the mako as “vulnerable to extinction” – which means that it is more threatened than the white rhino. Can you imagine a competition on the African savannah, where hunters in SUVs set out to kill white rhinos, sponsored by a vehicle manufacturer? 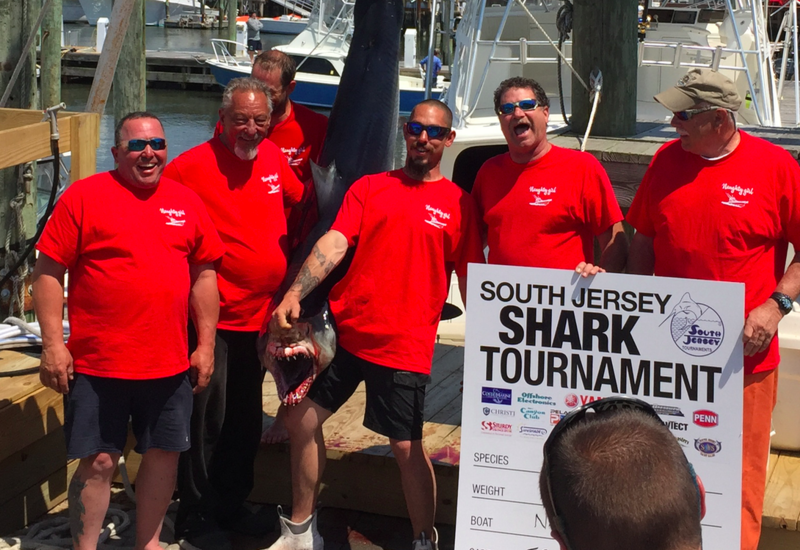 And yet here I was standing on the dockside, at a tournament that offers prize money to the sport fisherman who captures the biggest mako shark. The purse is not small – over $100,000 for the winner, and double that amount between category winners. There is a small entry fee, and a big corporate sponsor – in this case Yamaha, makers of outboard motors, motorbikes and pianos. Sharks have been swimming in our oceans for over 450 million years; and yet in one human lifetime we are pushing them to the edge of extinction. Some 100 million sharks are killed in our oceans each year – that’s over 270,000 sharks killed each day. While commercial fisheries are responsible for most of these deaths, in 2013 more large sharks were killed by sport-fishermen in the US than by fishing fleets. We must change our attitude to sharks, which have been demonised in 70s blockbusters like Jaws, and even more ridiculous modern film series like Sharknado. What are we thinking? We need to move away from a world where we fear sharks to a world where we fear a world without sharks. Starting with ending the competitive mass slaughter of threatened animals sponsored by corporations that should know better. I’m calling for a global ban on tournaments in which threatened species are killed. I’m calling on consumers to boycott Yamaha, Home Depot and Budweiser until they stop supporting this senselessness. And I’m asking you to join me in keeping up the pressure until they stop. I’ve swum over an ocean floor covered as far as my eye could see with whale bones; witnessed first hand evidence of how an industry hunted those animals almost out of existence. Today we look back on the whaling industry, its whalebone corsets and whale oil lamps, and think: how archaic. One day we’ll look back on sponsored shark hunts the same way. I just hope creatures like the magnificent mako will still be here when we finally come to our senses.